The MEC2016EVB_ASSY6797 kit is a development platform to evaluate the Microchip MEC1701X series microcontrollers. This board needs to be mated with part number MEC170X 144WFBA SOLDER DC ASSY 6801(cpu board) in order to operate. Microchip to provide the schematic for this board. UART0 is configured for serial logs. Please follow the jumper settings below to properly demo this board. Advanced users may deviate from this recommendation. These jumpers configure VCC Power good, nRESETI and JTAG_STRAP respectively. Each column of the following table illustrates how to enable UART0, JTAG, PVT SPI, SHD SPI and LED0-3 respectively. The jumper configuration explained above covers the base board. Now the CPU board requires the following settings. 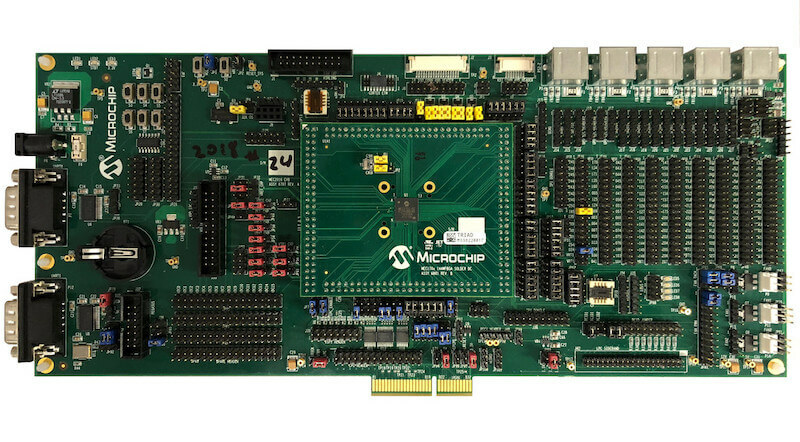 This board comes with a Cortex ETM port which facilitates tracing and debugging using a single physical connection. In addition, it comes with sockets for JTAG only sessions. Connect the SPI Dongle ASSY 6791 to J36 (SPI dongle) in order to flash and boot from SHD SPI NOR. Then proceed to flash using Dediprog SF100 or a similar tool for flashing SPI chips. Remember that SPI MISO/MOSI are swapped on dediprog headers! Once you obtain the binary, proceed to use the microchip tool mec2016_spi_gen in order to create the final binary. This binary is what you need to flash in your spi nor. You should see “Hello World! mec2016evb_assy6797” in your terminal.